A mix of Memphis, Macon & New Orleans with bluesy vocals and smooth, funky extended solos jammin’ over a tight rhythm section. His songs have been recorded by such artists as Gregg Allman, Tracy Nelson, The Allman Brothers Band, Jimmy Hall, Gov\'t Mule and Lee Roy Parnell. Jack\'s guitar playing has been featured on studio albums by Gregg Allman, Bobby Blue Bland, Jimmy Buffett, Chris LeDoux, Billy Montana, The Bacon Brothers and Jimmy Hall, among others. 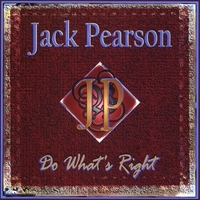 His versatility and outstanding musicianship can be heard not only on \"Do What’s Right,\" but also on three other Candlefly releases available on CD Baby...his first solo CD \"Step Out!,\" the instrumental album “Jack Pearson” and an acoustic blues duo titled \"William Howse & Jack Pearson.\"
Released in 2007. There are nine songs within eight tracks providing over 68 minutes of music on this disc. All of the songs are written/co-written by Jack with the exception of Rev. Gary Davis’\"Oh Glory How Happy I Am.\" The players include Dennis Wage (Hammond organ, keyboards), Elizabeth Pearson (bass) and Doug Belote (drums). The performances on this CD represent what Jack has been doing live for the last few years. Some of the song titles may be familiar, but the arrangements have been changed and extended with longer solos and improvisations. This is the best guitar and B3 work I've heard in many years. I highly recommend this CD.